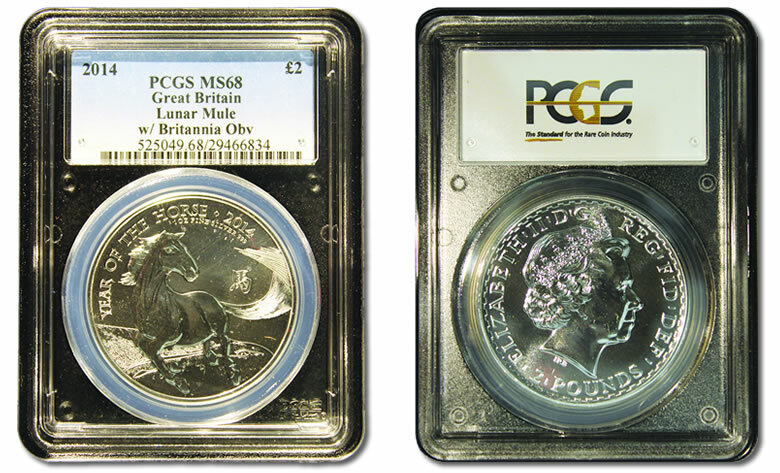 Varieties of bullion 2014 £2 Britannia and 2014 £2 Lunar Year of the Horse mule error coins have been authenticated, graded and certified by the Paris Submission Center of Professional Coin Grading Service (www.pcgseurope.com). A mule error happens when an obverse die for one coin is used along with a reverse die for a different coin. "It’s always exciting to see a new coin variety in person for the first time, and these beautiful coins did not disappoint," said Muriel Eymery, PCGS Vice President of International Business Development. "These types of errors are highly sought after by collectors and already are bringing extremely steep prices." The mule error varieties resulted from mix-ups in pairing dies at the Royal Mint when pressing 2014 £2 Britannia Bullion Coins and 2014 £2 Lunar Year of the Horse Bullion Coins. Both series have nearly identical obverses centered on Ian Rank Broadley’s effigy of Queen Elizabeth II. The inside rim of the two coins are how to tell them apart, with £2 Britannia coins having denticles and £2 Lunar coins having standard rims. Denticles are tooth-like design elements. One variety of mule error coins created by the Royal Mint is a £2 Britannia obverse with denticles coupled with the no-denticles reverse intended for the £2 Lunar. 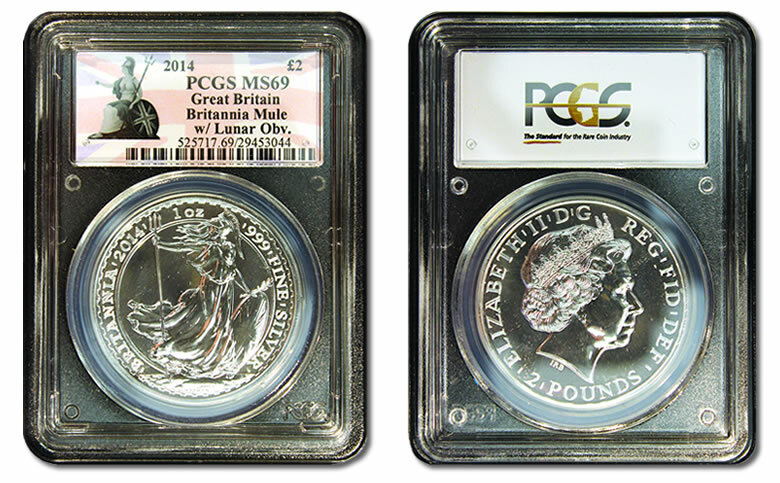 According to PCGS, it certified 461 of them during the PCGS Paris Grading Week held March 10 – 14. The Royal Mint estimates that about 38,000 exist. The second variety of mule error coins produced have a no-denticles obverse of the £2 Lunar coupled with the denticles reverse intended for the £2 Britannia. PCGS certified 22 of them in Paris. The Mint indicates that about 17,000 were made. The London Coin Company of London, England submitted the one-ounce, .999 fine silver bullion coins to PCGS, saying a client first alerted them to their existence. "We had a call from one of our clients explaining he had purchased a 2014 Britannia £2 silver one-ounce coin and he wanted to return it. He said it did not look like the picture of the coin he had purchased, and he thought the coin was a fake," recounted Ingram Liberman, President of The London Coin Company. After Liberman discussed the appearance of the coin with the client "the buyer quickly realized that, in fact, he had bought a £2 Britannia mule from us and wanted to hold onto it and to his collection. He appreciated our honesty and integrity," Liberman explained. Officially, PCGS notes that the Royal Mint is not calling any of these mule errors coins but "a variation in the design for a limited time only." Why Oh Why , just another scam to get people to believe this is a collectable item so they rush out and pay hundreds of pounds for a coin that will NEVER be worth more then £30 . They’re selling for a bigger premium then the regular Britannia’s because they are slightly rarer. Makes sense really. I have none but want to acquire some cheap. Right now it’s worth it’s weight in silver 19 dollars. It will take many years to find out the true value. Buy 1 and forget you have it for 20 years or die of old age first. But the true collector will have a peace of mind just having 1 in his collection. I have a bunch of the britannia’s. I just decided to do a random order of 8 silver britannia’s one day and when I got my order 4 of them had the errors. At first I thought they were fake and complained to the distributor I got them from haha. After I did some tests I determined they’re legit. Might have to put them in some PCGS containers I think. Then why is art worth more than the canvas it is painted on? At least here in asia these coins are in high demand. I have a few and plan on keeping them for a LONG time. of 17,000, that number compares very favorably to the U.S. 1955 Double Die Lincoln Cent. 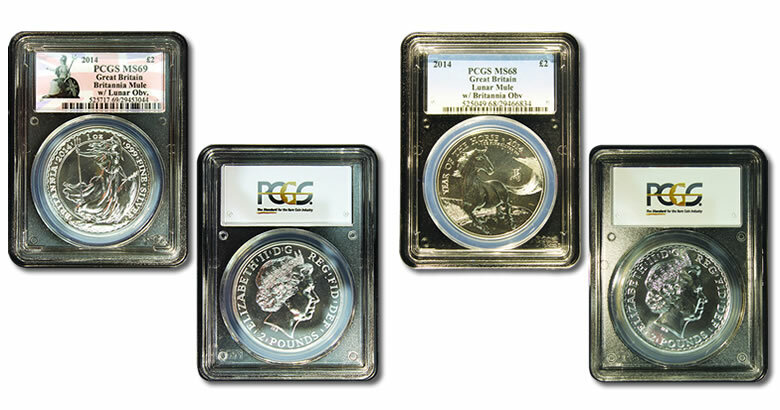 That coin in UNDER mint state runs about $2000 (US) A high end mint state uncirculated coin can run over $10,000 (US). If the numbers ARE correct, that means the potential of this coin on a world wide scale maybe limitless, and could realize thousands of dollars or pounds in fairly short order, say 3 to 5 years out. Oh, and what did I pay you ask? $495 US or just over 350 pounds. I believe that is a very good price, despite what some nay-sayers complained about earlier. I have just been going through my silver coin collection and I have come accross a 2014 Britannia mule error which has been graded by NGC on an early release (MS69) however they have not noticed ‘probably as it is an early release’ that it has the error and have therefore not graded it accordingly. Does anyone out there know how this might effect the value? I bought 2 graded by PCGS with the error coin but at the time it did not have the error label. This was about 3 years ago. PCGS was asking to return them and they would correct the label but I decided to keep mine. At the time there were about 38 of the coins like this.